This tiny-living thing is working for me. It's been about four months since we transitioned into living in a 275-square-foot box-on-wheels. There were a lot more kinks to work out than you might think! We leveled it, then ended up moving it 15 feet over and leveling it again. We figured out how to get the best use of our solar energy, after quite a few evenings of snuggling up by camp lantern and candlelight. We realized that the solar situation we have now can't support the washer/dryer combo we'd purchased, so we moved it out and have been doing our laundry by rolling it down the hill in a wagon. It also can't really support the refrigerator when it's cloudy for 3+ days, so awhile there we lived off campus dining and pantry food. There's been a lot of tweaking and moving and fixing and organizing. Composting and gray water situating. And a lot of thingamabob purchasing (thank you Amazon Prime!). I can't say it's been without trials but we've had so much fun piecing together this little puzzle of ours. Whether we planned to or not, we have been "nesting" since the day we found out about little figgy. It's been the perfect project to keep us focused on the present, encouraging us to put our energy into our home and ourselves. We're brought closer together each day, by the shared challenges, happy moments, and tight quarters. A productive weekend to us right now means accomplishing a tiny house project or two, and catching up fully on sleep (which makes my pregnant self incredibly happy). In this space that still feels new, we find adventure just by hiking in the nearby hills, watching hummingbirds outside our window, and sitting in our chairs outside the front door watching the deer and owls come out for the evening. We fit so well in this small space, made just for us, like a dreamed up treehouse or childhood fort. 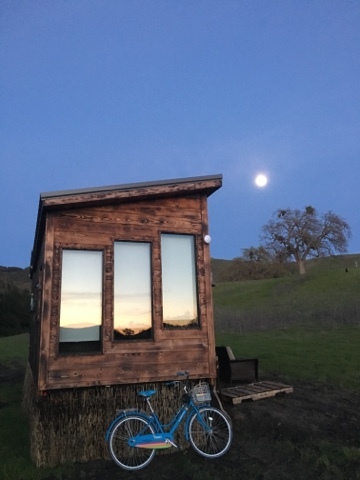 It's our teeny tiny home. I can't wait to continue tracking our tiny home progression with figgy's growth. Found out the gender - got the tiny house wifi situated. Felt the first movements - set up our projector and screen. Maybe next week it'll be: size of a carrot - built the deck! 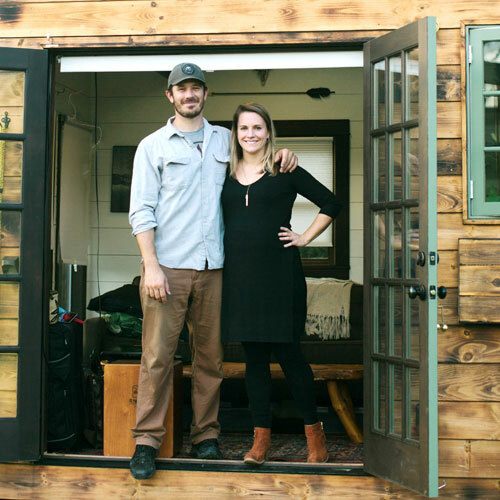 Thank you, tiny house, for growing with us! I'm so grateful for this season.